Paisano de La Cimarrona (2002): Young fino stallion imported from Colombia and not yet shown . His first offspring are yearlings of 2010. Salome de Lusitania by Extasis. 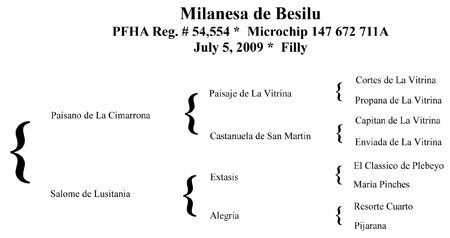 International Champion in Ponce, PR 2008, IPHF Nationals: 1st place Fino Mare and Reserve Grand Champion Fino Mare 2008; Confepaso 2007 Mundial World Champion Fino Filly in her age group, 2006 Colombian Expounaga Grand Champion. Also first placements at shows in Colombia before being imported to the United States. Dam of Eclipse de La Pradera (2010 Fedequinas Nationals, Colombia, 1st place fino in his age group).